Mike Filipek – Come on in! Editor’s Note: As we get going again, we’re featuring past reviews to help us get started. Here’s one from January 2002. In order to expand the boundaries of pop-rock, popularity is usually required. 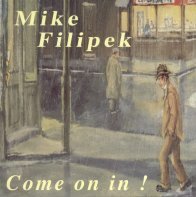 Mike Filipek and his debut CD, Come On In!, are worthy of the admiration and jubilation of the music hungry masses. Consequently, if Mike can get the exposure he deserves and desires, he may just expand the pop-rock genré, and Big Beef and Beer will be proud to say they helped. The current state of pop music is disgraceful. The canned and manufactured music and groups present the same trash again and again with an accent on style over substance. Come On In! is a breath of fresh air in an environment polluted with fluff. Mike Filipek is fresh, energetic, poetic, creative, impish, and a bit risqué all at the same time. Reflective and insightful aren’t always synonymous with peaceful. In fact, the main reason I enjoyed this CD so much is because of the consistently high energy levels and positive outlook even in the face disappointment. In Denied he sings “yesterday was tomorrow’s lie,” but moves on with “just denied, not a travesty, no empty hole inside. Just denied.” The title of the next track is consistent with his “let it roll” attitude – It’s Always Something. Mike Filipek’s attempt to expand the boundaries of pop-rock may happen one person at a time, or one gig at a time. If I ever have the chance to see him live, I will. If he can bring this much energy to a CD, he must be fantastic live. I don’t get to the Evanston, Illinois area often (ever), so for now I’ll settle for the CD. You can give it a listen yourself, and even pick up a copy at www.mikefmusic.com. Expand your musical horizons! are you the same mike filipek that used to live on parkside?